The twin towns of Tea Gardens, Hawks Nest is considered as “The North Shore of Port Stephens”. Our office encompasses the surrounding areas of Bundabah, Winda Woppa, Pindimar, Shearwater, Swan Bay, Nerong and Booral as well as the Branch. Hawks Nest Tea Gardens has retained all the virtues, quaintness and values of a country style seaside resort. Our area boasts 40km of fabulous sun-drenched surfing beach, with access for four wheel drives, glorious crystal clear surf with views out to Broughton and Cabbage Tree islands – home of the endangered Tern who has made his nesting site on Cabbage Tree Island. Unspoilt beach and bushland surround Hawks Nest on its eastern boundary, with Port Stephens as its Southern boundary. The Myall River, which meanders almost to Forster is the Western boundary, and to the North is Mungo Brush, the Myall Lakes National Park. Hawks Nest, Tea Gardens, Pindimar (one of the original choices for Australia’s Capital City), Bundabah and North Arm Cove are habitat to a myriad of wild life – Koalas, dingoes, echidnas, wallabies and a vast array of bird life including, pelicans, Kookaburras, Bower Birds and Bush Turkeys. 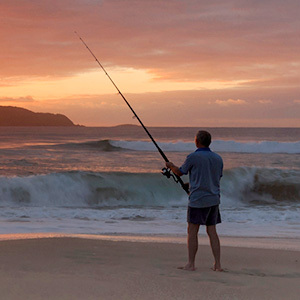 The Port Stephens Myall Lakes area is one of the States largest seafood producers. For the amateur angler this area is a fishing haven offering, beach, river, lake and rock fishing and for the more adventurous fisherman we offer offshore blue water fishing for Marlin, Snapper, King Fish, Mowong around the Cabbage and Broughton Islands. The area offers many boat ramps to access our water wonderland.Our waters abound with seals, penguins, turtles, the largest Dolphin population in New South Wales and migratory Whales. For the land lovers we offer a championship 18-hole golf course at Hawks Nest, Lawn Bowls at the Tea Gardens Country and Bowling Club, bush walking along the world-renowned Mungo Brush bush-walking track, Tennis and Croquet courts, and safe cycling with very few hills. Horse riding and free electric BBQ’s are available along the Myall River as well as Hawks Nest Beach. Now for the nightlife…We have the Tea Gardens RSL Bowling Club, Hawks Nest Golf Club, Tea Gardens Hotel and a fine selection of Restaurants as well as takeaway venues. Many local venues offer live entertainment over the weekends and weekdays during holiday seasons. Specialty shopping at Myall Plaza in Tea Gardens. Myall Quays Shopping Village incorporates BILO Supermarket and a variety of specialty shops. Medical Centre as well as one other Doctor, Dentist and Optometrist plus the Paramedic Ambulance base is available 24 hours a day. In an emergency the Westpac Emergency Helicopter is available servicing the John Hunter Hospital. Raymond terrace has 3 shopping plazas and a market place located 40 minutes south of Tea Gardens/Hawks Nest. The Visitors centre is located near the Tea Gardens/Hawks Nest Bridge on Myall Street, Tea Gardens. There is a bus service to Raymond Terrace, Newcastle and Sydney. A ferry service leaves four times a day for Nelson Bay. The airport is a 40 minute drive to Williamstown. With over 40 km of surf beaches, some with four-wheel drive access, fishing and boating feature prominently in the sporting diet of local residents. Hawks Nest claims to have the best 18 hole wet weather golf course in the Hunter Valley. Tea Gardens has a swimming pool built on the site of the old punt by money raised by the local community.